The idyllic and largely forgotten Oberemmeler Altenberg is located in a side valley by Oberemmel. 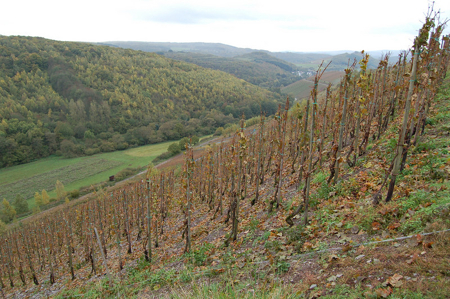 The parcel of old Riesling vines in the foreground are from Moritz Gogrewe, who once, many years ago, was the vineyard manager at Van Volxem and who now sells most, but not all, of his grapes to Immich-Batterieberg. The purchased grapes from Moritz's vineyards go in Immich-Batterieberg's very good estate wine, known as C.A.I. Oberemmeler Hütte and Scharzhofberg can be seen in the background. Photograph courtesy of Isabelle Fredriksson.